The History of Ed-Tech: What Went Wrong? 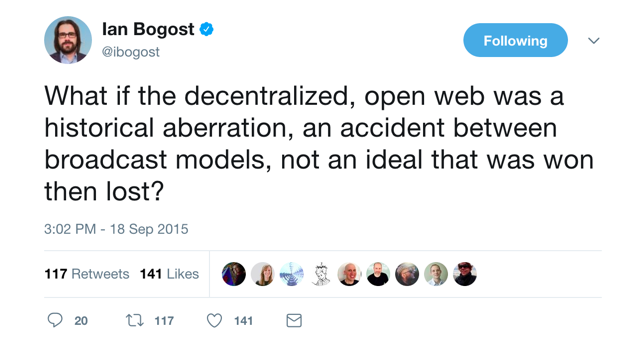 But what if, to borrow from Ian Bogost, “progressive education technology” – the work of Seymour Papert, for example – was a historical aberration, an accident between broadcast models, not an ideal that was won then lost? There’s always a danger in nostalgia, when one invents a romanticized past – in this case, a once-upon-a-time when education technology was oriented towards justice and inquiry before it was re-oriented towards test scores and flash cards. But rather than think about “what went wrong,” it might be useful to think about what was wrong all along.